One of the biggest names in Lorain County media has passed away. The newspaper he ran, the Elyria Chronicle-Telegram, reports the “unexpected” death of publisher A. Cooper Hudnutt, dead at the very young age of 57. Hudnutt, known throughout Lorain County as simply “Coop,” was found dead in his Elyria home, according to family. He had been publisher since 1991, when he replaced his father, Arthur D. Hudnutt. He also served as president of the board of Lorain County Printing and Publishing, which operates The Chronicle and various print, radio and online web properties. And that last sentence also brings this into the broadcast world, where the company owns a number of Northern Ohio stations under the Elyria-Lorain Broadcasting name: Cleveland market AAA WNWV/107.3 Elyria “V107.3”, sister news/talk WEOL/930 Elyria, and a cluster of stations to the west, country WKFM/96.1 Huron “K96”, and Norwalk’s AAA WLKR-FM/95.3 and oldies daytimer WLKR/1510 “Kool Gold”. Lorain County Printing and Publishing also owns the Medina Gazette newspaper. “We’re slipping,” as a reader said. Just days after our big return, your Primary Editorial Voice(tm) became scarce, and we did not invoke our Secondary Editorial Voice(tm), though we notice he was busy with some items “off stage”. EARLY CAST: Scripps ABC affiliate WEWS/5 is joining a growing trend in local TV news across the country – pre-5 AM newscasts. ABC has actually made it somewhat easier for local stations to start at 4:30 AM. AND ABC: Except for a brief period as the market’s CBS affiliate after signing on, WEWS has been Cleveland’s ABC affiliate for decades…and that will continue for some time. Back in 1994, in the midst of the FOX/New World Television affiliation upheaval that affected WJW/8 and WOIO/19, ABC was worried about losing their affiliations on two of Scripps’ biggest stations, WEWS/5 and former charter ABC O&O WXYZ/7 Detroit. So much so that not only did ABC buy longtime NBC affiliate WTVG/13 Toledo and WJRT/12 Flint, but then negotiated a long-term affilation deal with most of Scripps’ ABC stations, as well as two former FOX affilates (Tampa and Phoenix) displaced by the New World deal, and a former NBC affiliate (Baltimore) that was affected by the subsequent CBS/Group W merger. WTVG and WJRT were additional insurance for ABC if the Scripps deal failed to go through. All it meant for the Cleveland market was that WEWS was able to maintain their ABC affiliation, which dates back to 1954, for a long time to come. And now you can tack on five more years to the deal, as ABC and Scripps were able to land a long-term extension on their affiliation deal. IT’S BEGINNING TO LOOK A LOT LIKE…: The early switch of Clear Channel hot AC WMVX/106.5 “Mix 106.5” to Christmas music left many wondering… why was CBS Radio AC WDOK/102.1, the traditional leader in Cleveland’s Christmas Radio Parade, still running its regular music format? Wonder no more, as “Soft Rock 102.1” officially flipped the Holiday Switch on Monday morning at 7. Umm, OK…you were waiting for Channel 5 to nudge you into it. OK, we buy it. Anyway, the release notes that WDOK has been “Cleveland’s Holiday Music Station for the past 11 years”, though some note that WMVX’s “MixMas” was actually the first holiday music flip in the market some years ago. We don’t remember, though we do know that “Mix” hasn’t done “MixMas” for many years. MOVING, SORT OF: Trinity Broadcasting O&O WDLI/17 Canton disappeared from digital over-air tuners and boxes this week, and there’s a reason. After getting a reader tip on changes at the religious outlet, we got our converter box up and running again, rescanned, and sure enough, WDLI has finally made the move from RF channel 39 to RF channel 49. The station – actually physically in the Akron antenna farm near Rolling Acres “What’s Left Of It” Mall – made the move after Western Reserve PBS’ WEAO abandoned analog channel 49, in favor of RF channel 50 digital (still displaying as 49), in the transition from analog broadcasting. The biggest reason for WDLI’s move? Camping out on RF 49 allows it to increase power from 200 kW to 900 kW, presumably improving the TBN outlet’s signal somewhat over areas, say, north of Akron. The WDLI move should presumably pave the way for Image Video’s WIVM-LP/52 Canton to move to 39, which it applied for shortly after TBN went for 49. The 39 facility for currently-analog WIVM would be a 15 kW digital outlet. * WDLI, after the move to RF channel 49, still displays on digital tuners as 17. * WEAO continues on its RF 50 facility, and displays (as always) on digital tuners as 49. So, WDLI can move to RF 49, since WEAO isn’t really there, and hasn’t been since the digital transition. * WIVM, when it makes the move to digital RF channel 39, will display on digital tuners as 52. To viewers, it makes no difference, except for the fact that when WDLI abandoned 39 for 49 (while still displaying 17), it disappeared from over-air tuners. The best such tuners can handle changes within an RF channel – our Zenith box automatically picked up the change from WOAC/67 to WRLM/47, since the station never actually “moved”…it just changed its display information. The former analog 67 was on RF channel 47 the whole time. GOING CLASSICAL: Some changes in the Columbus market are about to happen. After a brief delay apparently caused by an informal objection, the FCC has approved the sale of Fun With Radio alt-rocker WWCD/101.1 Grove City to The Ohio State University, which plans to convert it to a 24/7 classical music service, freeing up WOSU-FM/89.7 to convert to a news/talk format (in tandem with the University’s existing WOSU/820). Then, presumably and finally, WWCD will drop the “101” part of its current branding (“CD 101 at 102.5 FM”) and camp out solely on the current WCVZ/102.5 Baltimore, which it has been simulcasting on since shortly after the sale was announced earlier this year. 102.5 is, of course, owned by Zanesville’s WHIZ Media Group, which moved the facility from its hometown to just southeast of Columbus, and moved its local hot AC WHIZ-FM to 92.7/South Zanesville, formerly owned by Christian Voice of Central Ohio. We note again that, as far as we know, WWCD owner Roger Vaughan isn’t planning an immediate purchase of his new signal, though we wouldn’t be surprised if he makes that filing after all the financials are done regarding 101.1. For now, he’s LMAing 102.5 from the WHIZ folks, and WWCD is apparently in the process of moving its primary equipment/feed to feed 102.5 instead of 101.1. When does 101.1 start pumping out Bach and Beethoven instead of modern rock? TV ESSENTIALS: Northeast Ohio is one of just two test markets for a new Time Warner Cable offering. “TV Essentials” is a $29.95 package that will offer a number of channels in a tier somewhere between basic “lifeline” cable and expanded basic. Most notably missing from the “TV Essentials” list is the reason the package even exists: many of the major sports channels, including both ESPN and Fox Sports networks, are not on the list. ESPNews does make the cut, but live sports cablecasts on the other members of the “ESPN Family of Networks” are out. Of course, live over-air network sports are there via the local channels, though we’re pretty sure SportsTime Ohio is also not on the “TV Essentials” list. Several other popular cable networks are there according to a list we saw online, including TBS and TNT, CNN (but not Fox News Channel, presumably due to cost and not politics), and the like. The networks being offered are: A&E, AMC, Animal Planet, BET, Biography, Boomerang, Bravo, CNN, Cartoon , Centric, Cooking Channel, Discovery, Disney, ESPNews, FX, FitTV, G4, GAC, GSN, Gospel Music, HGTV, HLN, HSN, Hallmark, History, Jewelry TV, Lifetime, MTV, Military Channel, Nickelodeon, Nick Jr, QVC, Shop NBC, TBS, TV Guide, TV One, Teen Nick, USA and, VH1. Again, “TV Essentials” exists because of costs. The cost-per-subscriber of the major sports networks we listed are responsible for much of the expanded basic bill. The $29.95 pricing in Northeast Ohio – and $39.99 in New York City – is listed as a promotional price for the next 12 months. “TV Essentials” is apparently expected to be offered at $49.99 after that…. ANDREW Z: We haven’t paid that much attention to Toledo as of late, but we do have to note that a popular morning drive radio personality in Northwest Ohio is in legal hot water. The Wood County Prosecutor’s Office says a grand jury indicted radio host Andrew Z. on several felony charges Wednesday. Andrew Zepeda, also known as Andrew Z, was indicted on one count of breaking and entering, one count of theft and one count of failure to pay sales tax on his Perrysburg restaurant. This comes after a break-in at Zepeda’s former pizzeria at Levis Commons on Oct. 15 and 18. Earlier this month Perrysburg police charged Andrew Z’s uncle, Paul Zepeda, and David Wright with breaking into the restaurant. “I 100-percent have nothing to do with this,” he said. The radio personality said he has been “targeted by the police” since the beginning of the investigation. “Since the break-in happened, in my opinion, the Perrysburg Police have targeted me been on a witch hunt to smear my name and find evidence that could find me somehow linked to this case, which I have nothing to do with,” Zepeda said. Zepeda said there have been rumors that have surrounded this case, but he is in no way associated with the break-in. Andrew points to a man who was taken in by his family, the aforementioned Mr. Wright, saying he’s responsible for the break-in. As usual, if it doesn’t involve his radio career, we aren’t going to pay a lot of attention to it, or even to the much-more-interesting rumors we’ve heard swirling around the same program and station. LASH EXPANSION: Some big news out of Chris Lash’s radio operation in the Mahoning Valley. Fresh on the heels of nabbing former WQXK/105.1 “K105” personality Burton Lee for his classic country outlet, WRTK/1540 Niles “The Farm”, the sports side of the Whiplash Radio operation gets another well-known Youngstown market name. He’s veteran sportscaster John Caparanis, long-time sports director of Cumulus sports WBBW/1240 “ESPN 1240”, who moves his weekday “Tip of the Cap” show to Lash’s classic hits WANR/1570 Warren “The Blizzard”. Lash says Caparanis will also do sports play-by-play and sales for the stations. Though Caparanis is not “a Warren native” (he was apparently born in Steubenville), he moved to the Trumbull County seat while in high school, and graduated from Warren G. Harding High School. He’s a member of the Trumbull County Sports Hall of Fame, and has broadcast sports, mostly on WBBW, since the late 1960s. SIMON STAYS: One of the first moves we expected, after former Clear Channel Cleveland programmer Kevin Metheny exited the PD chair at Tribune talk WGN/720 Chicago, has not happened. One of the first moves Metheny made at WGN was to bring aboard Simon Badinter for the weekend “Simon Rendezvous” show, which had only recently started at Clear Channel talk WTAM/1100 in Cleveland. The heavily accented French-born advertising executive ended up on the WGN Sunday night schedule…and despite some changes to the station’s weekend lineup after Metheny’s departure, “Simon Rendezvous” is still on the WGN schedule. We heard about the weekend WGN changes from veteran Chicago media observer Robert Feder, the former Chicago Sun-Times columnist covering media for Chicago Public Radio’s WBEZ these days. Feder, who apparently became aware of OMW when we name-checked him in the last item, tells us Simon is indeed safe “for now”, as his show is not touched in the latest round of changes at the big Chicago talk station. It still airs Sunday nights 6-8 PM (CT), give or take a Chicago Blackhawks game or three. We’ve kicked this around with some OMW readers, and the general thought is that it’s more trouble to mess around with Sunday night than it’s worth. Though many in our readership here in Northeast Ohio see Simon as a symbol of the Randy Michaels/Kevin Metheny era at WGN, the reality may be that they just haven’t figured out what (if anything) to do with Badinter yet, and it’s easier just to let him continue in the low-profile weekend slot – for now, at least. NO DANNY RIDE: A veteran former Cleveland radio personality is out of his weekend gig with Cleveland-based Envision Radio Networks. Envision Radio Networks is pleased to announce the launch of The Live Ride With Marty McFly, which makes its debut November 22nd. The new two hour radio show, hosted by country radio veteran Marty McFly (WKDF-FM/Nashville), brings a weekly “concert” to country radio featuring live performances from today’s brightest stars. As a Nashville insider, McFly will provide the most up-to-date country news, concert information and artist interviews along with the perfect soundtrack for country radio listeners to relive their favorite country concert experiences! And it’s apparently that “Nashville insider” thing that prompted the change for the show formerly hosted by now-Seattle-based Wright. We wish Danny all the best, and anyone considering launching a competitive country outlet in Cleveland would do well by hiring him for afternoon drive, and former WGAR colleague Jim Mantel for morning drive. It’s not necessarily breaking news, but less than two weeks ago, Radio One urban talk/brokered WERE/1490 dismissed morning host Basheer Jones. His last day at the station was on Thursday, November 11. And Jones’ fanbase has not taken the situation lightly. A group of listeners gathered outside of the Radio One studios on St. Clair Avenue to protest his dismissal. While no one from the station group has given a reason for Jones’ dismissal, his wife told WEWS/5 that it was a budget-related move. Jones’ show was unique in many ways. A community activist and volunteer, Basheer took over the morning slot from onetime sportscaster Ronnie Duncan back in early 2007, and was able to build a loyal and devoted following. It also was unique in that the other stations in the Radio One cluster – WZAK/93.1: Tom Joyner, WJMO/1300: Yolanda Adams, WENZ/107.9: Ricky Smiley – each offer a syndicated morning show. And to his credit, Jones posted a thank you letter to Radio One on his own blog, thanking the station group. I want to thank Radio-One for the opportunity to Please God, my Mother, and my community. I thank Radio-One for the opportunity to bring a breath of fresh air to a city that is drowning in poverty and crime. I thank Radio-One for allowing me to bring a balance to the stereotypes against black males, muslims, young people, Clevelanders, Morehouse, inner city, Alpha’s, and every other group that I speak on behalf of. Through Radio lives were changed for the better, perspectives were altered, people were educated, movements were birthed, people were inspired, and my mother transitioned being proud of me for speaking up for the voiceless. What else can I ask for? Radio-One thank you so much for the opportunity. But I have to be clear Radio-One before I became a Radio Show host I was a community activist, while I was a Radio show host I was a community activist and long after I will be a community activist. For now, WERE is simulcasting the first three hours of Tom Joyner’s morning show (the 9 AM hour is and always was reserved for an hour-long health foods infomercial). From all the reaction coming out after a certain piece of big radio news from Chicago last night, you’d think Kevin Metheny had killed a man. As you’ve probably heard by now, Metheny “exited” (was pushed out the door, etc.) as program director of Tribune talk WGN/720, just weeks after his former Clear Channel colleague and Cincinnati-area resident Randy Michaels left as CEO of Tribune. We’re talking about Metheny, of course, because he was once a key player right here in Cleveland…as VP/Programming at Clear Channel’s Cleveland cluster. You could probably get Metheny to admit that some things did not work at WGN, and some things did not work spectacularly (Laski would probably head up that list). But the enmity we’re seeing this morning in the Chicago radio community is unmatched, in our experience, and comes with a strong “Ding, dong, the witch is dead!” theme running in the background. Arrogant, aloof, stubborn and contemptuous of the legacy he’d inherited, the man known as “Pig Virus” nearly destroyed one of the greatest brands in American broadcasting by alienating hundreds of thousands of loyal listeners and breaking bonds of trust that had endured for more than 80 years. Now, in his role as The Unofficial Protector of Chicago Radio Glory, Feder goes a bit over the top at times. But we respect and admire his long legacy of media criticism in the Chicago market, and really, it’d be hard to characterize – even by Metheny’s defenders – his turn programming WGN as a “success”. Not everything Metheny did was undone last night, and the station, in a statement by its once-again-in-charge VP/GM Tom Langmyer, seems to be moving forward with other Metheny-started lineup changes, including the addition of former WLW/700 Cincinnati voice Mike McConnell. We haven’t heard all of Mike McConnell’s repetoire, but “angry” and “aggressive” are not words we’d use to describe him. We still think McConnell is a good fit for a WGN that’s seeking to broaden its demographic base, perhaps now even more so under different oversight that could make the transition less, well, jarring. We don’t believe Cunningham, a talented broadcaster with a well-defined “schtick”, would have been a good fit for WGN, and had he made it to Chicago, he’d probably have been out the door with Metheny and Laski last night. One Metheny trait was more than evident in Chicago…his belief that he can create talk radio stars. We saw it actually happen here in Cleveland, where Metheny (as CC’s lead programmer) nurtured and grew the career of WTAM/1100 afternoon driver Mike Trivisonno…a man with a questionable grasp of the English language who became the market’s dominant AM talk radio host. But we also saw curious Metheny experiments here. Remember, he was proudly the “talent coach” for Air America/Clear Channel syndicated liberal talker Jerry Springer (who once put a crater into WTAM’s ratings), and even said so on the air. On his BEST days, TV trash talker Springer was a bad political radio host. And then there’s “the French guy”. Metheny inexplicably gave a regular WTAM weekend show to French-born advertising executive Simon Badinter (“Simon Rendezvous”). When Metheny landed in Chicago, he brought Badinter to the WGN weekend lineup. We’re willing to believe that Mr. Badinter is a nice, decent guy…but neither Clevelanders or Chicagoans warmed up to a show hosted by a radio novice with a very, very thick French accent. We wouldn’t be surprised if “Simon Rendezvous” was gone from WGN as soon as this weekend. Metheny’s departure from the WGN programming job is an excellent opportunity to catch his podcast with Margaret Larkin, who runs the “Radiogirl” series of Chicago-based podcasts. The podcast in question was done back in May, and we believe Ms. Larkin also has relatives in Northeast Ohio. HO, HO, HELLO: There have already been early Christmas music flips, even though Thanksgiving is still a few weeks off. Cleveland got on the Holiday Music Sleigh Ride today. That puts “Mix” on Santa’s list before two Cleveland stations that usually go first in the Holiday Parade…CBS Radio AC WDOK/102.1 “Soft Rock 102.1”, and Salem CCM WFHM/95.5 “The Fish”. At last check this afternoon, both stations were in their normal music rotation. For its part, WDOK is asking listeners, on its website, to help determine the holiday music rotation, and a countdown notes continuous Christmas music should start at…let’s see…about midnight on the early morning of Friday, November 19th, if we’re doing the math right. NO SNOW JOB: We believe our Second is writing up a more extensive article on this, but we were close enough to the Mahoning Valley today to confirm one announced format change. Whiplash Radio’s WANR/1570 Warren has indeed flipped to a “Classic Top 40” format as “The Blizzard”, with local news (and announced sports). In our brief time in the station’s signal range, we heard what sounded like RKO’s Classic Top 40 format, though the promised on-air personalities were missing…it sounded to us like those personalities feed voice tracks that WANR didn’t have yet. Why else would you hear the “Classic Top 40” jingles and jock shouts for afternoon driver Eric Chase, but not hear Eric? We’re sure that’ll be corrected soon. As we noted on our Twitter feed, “Classic Top 40” features at least two names that have been heard in Northern Ohio before – maybe three. John Records Landecker did morning drive at then-WPHR/107.9 “Power 108” in Cleveland, and yes, “Records” is really his middle name. Jim Zippo was heard on local affiliates of ABC/SMN’s “Pure Gold”, where he programmed and held down the morning show. Heck, we believe even WANR itself was once an affiliate of the ABC format, though it was – by that time – “Oldies Radio”, and Zippo had been gone for a while. It’s now Citadel’s “Greatest Mojo”, and airs on BAS Broadcasting’s WOHF/92.1 Bellevue “The Wolf”. We say “maybe three” because we don’t remember if Cincinnati-based Marty “With The Party” Thompson’s voice ever made it up here when he worked for Clear Channel in Southwest Ohio. The newscast name apes, of course, the “AkronNewsNow” name given to the news operation at Akron’s Rubber City Radio Group, and Lash has indeed cited RCRG’s oldies/news WAKR/1590 Akron as an inspiration behind the moves at “The Blizzard”. The move was also prompted by the move of Fox Sports Radio across the market – where it’ll reportedly supplant standards at Clear Channel’s WNIO/1390 Youngstown. Though FSR has yet to show up on WNIO, at least as of this afternoon, the station has already claimed the sportsradio1390.com domain, which currently forwards to the existing WNIO site. Our first clue of that? We were trying to track the format change over here, and the WNIO “Listen Live” link directs you to a player at sportsradio1390.com. That move leaves the older skewing market of Youngstown with just one adult standards outlet, Cumulus’ WSOM/600 Salem. LOOKING BACK: Northeast Ohio’s Time Warner Cable operation is Looking Back. No, not to the days of Akron Cablevision, Warner Cable or Warner-Amex Cable, but forward to a new service that is a supplement to the cable system’s “Start Over” feature. To use this feature, Digital Video customers simply use the “Select” button on their remote control then choose Look Back to find a program. The available window for these programs will be 72 hours. For example, if a show airs from 8:00-9:00 p.m. on Tuesday, customers can view that show immediately after it has aired until 9:00 p.m. on Friday. Customers may also pause and rewind their program selection. OMW hears that “Uncle Bill” Weisinger, veteran local radio engineer and volunteer program director of WSTB/88.9 Streetsboro’s “Sunday Oldies Jukebox”, passed away this morning. Unfortunately, Bill’s passing is no surprise to OMW readers, as we informed readers of his courageous battle against a cancerous tumor… and let people know back in late August that Bill was maximizing his time with friends and radio colleagues. 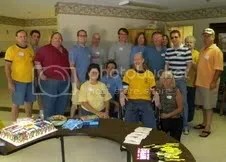 This picture is reprinted from our earlier item, where a host of friends visited him at a local care center in August. And in an odd coincidence, we were paging through some of these old posts late last night, and had intended to check on Bill’s current condition today. He’d even been in E-mail contact with us as recently as late September. He was also still reading (and posting to) GetWellBill.com, the guestbook set up to send him messages…as recently as last month. Sadly, Uncle Bill passed away this morning. Your messages and kind words brought much joy to our friend throughout his ordeal. From all of us at the Sunday Oldies Jukebox, our heartfelt thanks for your thoughtfulness and compassion. You helped to brighten Uncle Bill’s days. We will add other messages about Bill to this item. Former WTAM/1100 afternoon producer/co-host Paul Rado is now a very busy fellow. Not only will he be a co-host on Digital Sports Network/Cleveland.com’s new afternoon drive program (alongside Harry Petsanis and former Fox Sports Radio host/actor/comedian Chuck Booms), Rado has a new television game show that will debut on local television starting in December. It’s “The Star Frame Bowling Challenge,” a weekly bowling competition reminiscent of the iconic late 70s’ franchised game show “Bowling For Dollars,”* but was developed to be a Cleveland show, along the lines of legendary horror hosts Ghoulardi, Houlihan, Big Chuck and Lil’ John. Based around the country’s most popular recreational sport, “Star Frame” will have easy to follow rules, fast-paced action, and a high-energy in studio audience. Raycom’s two Cleveland stations, CBS affiliate WOIO/19 Shaker Heights and MyNetwork TV affiliate WUAB/43 Lorain have picked up “Star Frame” – WUAB will air it Saturday afternoon at 4:30 p.m., while WOIO will air it Saturday night at 12:05 a.m., right after “Warrant Unit,” hosted by WTAM host Bob Frantz. Rado will be teamed up with longtime WTAM colleague Marty “Big Daddy” Allen and SportsTime Ohio host Chuck Galeti on the program. Portions of the pilot episode have already been posted online by Rado (part 1) (part 2). If those previews are any indication, the show has a very promising future, indeed. …and, we’ve known about this for weeks, and even hinted about it once or twice, but it’s apparently now official. OMW hears that Cleveland sports media personality Tony Rizzo announced on his “Really Big Show” on Good Karma sports WKNR/850 “ESPN 850” that he’ll stop burning the sports candle at both ends. And no, he’s not giving up radio. Why leave TV and stay with radio? We don’t know exactly what happened with Rizzo’s contract with Fox 8. We’re told that Rizzo said he was leaving the TV side of his career to spend more time with his family, and that he was exercising an “early out” in his WJW deal. But, it’s not a surprise to anyone who reads this blog that local TV stations are trying to pare down salaries by not renewing expensive talent contracts. The same scenario has already played out at other stations in the market…either the station decides not to renew, or won’t renew at or above the cost of the personality’s current deal. We also hear that Rizzo hasn’t been happy with how “Fox 8” has handled sports coverage recently. In general in local TV, sports segments have been “getting the squeeze” in an age where sports scores and highlights are available 24/7 via the Internet and various sports TV networks.